The Margery Bradley stone marks the meeting point of three parishes. 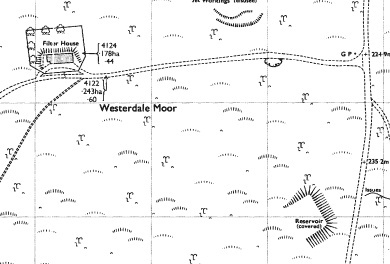 Farndale East, Rosedale West Side and Westerdale. An ordnance survey mark has been cut into the road side. The other face was inscribed “TD” for Thomas Duncombe in the 18th century. The stone has existed as a waymarker since medieval times, but it could have originally have been from the bronze age and be associated with the nearby Flat Howe burial mound. I must have passed this hundreds of times and never noticed the inscription before. Frank Elgee was born in North Ormesby on 8th November 1880, when the Dorman Museum opened in 1904 he was made assistant curator and became the curator in 1923. Elgee died in 1944 and this memorial stone was erected in 1953. This strongly built building first appears on maps some time between the late 1950s and early 1970s. That co-incides with the reservoir to the south-east being built. 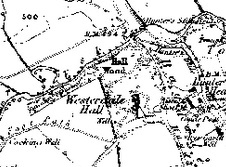 Pevsner states that Westerdale Hall was built as a shooting lodge for the Duncombe family before 1874 by Thomas Henry Wyatt, well before because the first edition OS map from 1857 shows it. The building is now in private ownership again. This roadside guidestone has full listed building status. A carved hand points the direction to Whitby. Other faces list Stoklay (Stokesley) and Kirby (Kirkbymoorside). These two identical houses were built 1865-67 for Thomas Vaughan. No 274 Marton Road was known as Beresford House. In 1889 it was onwed by Marmaduke Watson Proudlock who was the general manager of the Teesside Iron and Engine Works. The next owner was Colonel Penry William who renamed it Consett House, he was later to become MP for Middlesbrough in 1910. In later years it has served as a Salvation Army Home. The neighbouring Park View was originally owned by Sir Joseph Calvert (one time Mayor of Middlesbrough), it became a medical centre in 1932 under Dr William Irwin.